He’ll start the year in AA, but will almost certainly be up later this season. When Rubby was traded from the Dodgers to the Red Sox last year, he followed the path of another Dominican pitching prospect who was reared in the Dodger system – Red Sox legend Pedro Martinez. If you were the kind of kid who organized your baseball card books with the backs of the cards facing out, go and have yourself another look at Pedro’s statistics with Boston. We were alive to see that man play. And unless you’re from New England, it was awesomely annoying. Pedro compares Rubby to Roger Clemens and Juan Marichal. As an old family friend (Rubby’s grandmother was Pedro’s nanny) he may have some idea. It sure can’t hurt that Pedro taught Rubby his changeup. If it’s 80% as a good as Pedro’s, us non-Boston fans will be annoyed by Rubby for years to come, but first he’ll get some time in the minors to get settled. Dellin, who was born in Washington Heights and went to high school at Grand Street Campus School in Brooklyn, is exactly the kind of story the Yankees want to tell in their media guides. He was in the stands for David Wells’ perfect game in Yankee Stadium, and when the 6’8”, 245-lb. Dellin decided to switch full-time to baseball from basketball, Yankees scouts looked at his frame and saw a pitcher that could devour a lineup like a bear with a box of Thin Mints. The Yankees gave him $1 million in 2006 to keep him from playing baseball for Vanderbilt University, and he made their top prospect lists regularly in the years to come. Then he got wild, and then he got hurt, or maybe got wild because he was playing hurt, and his overall performance slipped. He made it to the majors briefly in 2011, and the batters who faced him would’ve loved to see him again. So far, it’s not to be. He opened 2012 in AAA ball and was so bad, he was demoted to AA mid-season. Now he’s 24, still young, but still on the outs; the Yankees sent him to the minors early in spring training. Jake has got to be the most-traded top pitching prospect in world history. He’s only 22, and he’s already played in the Milwaukee and Kansas City organizations, and now joins Tampa Bay, where he’s likely to join their starting rotation this year. For a guy almost as highly regarded as Dylan Bundy, Jake follows a different dietary avenue to success. He eats Taco Bell and has his favorite hometown soft drink – a product called Ski Soda – sent to the locker room. And he’s almost as good; last year in AAA he went 11-3, with a 2.93 ERA and 88K in 107 innings. 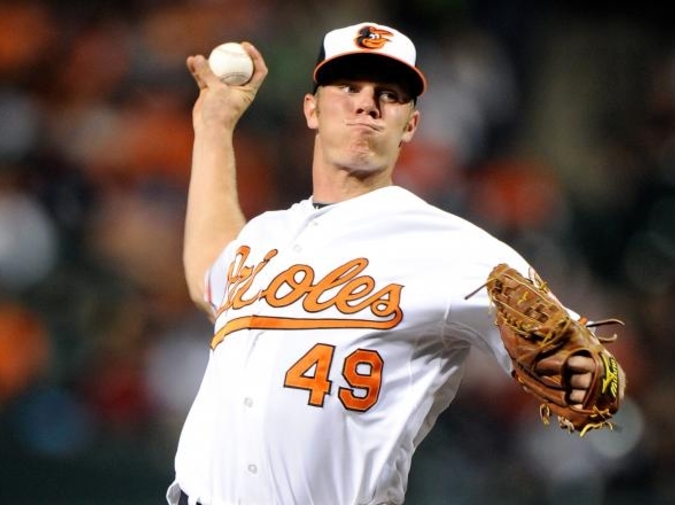 It seems likely he’ll face Dylan Bundy in his career, maybe as soon as later this year, when each are called up from the minors, and we’ll at last see who wins between Taco Bell and Whole Foods. Here’s another prospect that’s been bounced around a lot; Lars is already on his fifth team and his third of the offseason, being claimed off waivers from the White Sox earlier this year. He’s shown some compelling power in the minor leagues, at one point breaking bulbs in a scoreboard with a home run. He has yet to hit a homer in the majors. I hope no one blames his taste in music, which is interesting for a ballplayer. Major league players often choose a song to play as “walk-up” music when their name is announced at their home stadiums. Lars chose Muse at first, but is also into Daft Punk, the Naked and Famous, Arcade Fire, Dawes, and The Strokes. I was hoping during his few weeks in Chicago, he’d accidentally discover Northwestern University’s avant-garde college station WNUR and it would break his mind and instantly evolve his taste from “weird for an athlete” to “weird for a found object sculptor.” We’re way past due to hear Merzbow, John Zorn’s Masada project, or a song from the No New York compilation while standing in line for Bud Light in a souvenir cup. Whether it’s in Toronto or in Lars’ sixth major league team, one can dream.